Oatmeal Coconut Chocolate Chip Cookies, Apricot Almond Cookies(gluten/soy free), Chocolate Mint Sandwich Cookies, Granola Bars, Double Chocolate Brownies(gluten/soy free) and Vanilla Cream filled Cakes are at the co-op. Macadamia Chocolate Chip Cookies, Peanut Butter Cookies, Cherry Coconut Cookies(gluten/soy free), Oatmeal Cream Pies, Cherry Lemon Muffins, Lemon Poppy Muffins and Chocolate Cakes with Ganache and Raspberry Filling are at the co-op. I'll have a table set up at the WVUH Farmer's Market Wed. August 25th from 11 a.m. -3 p.m. The market will be set up between the cancer center entrance and the parking garage. These are a few items that I will have there. Stop by to say hello and pick up a treat! Lemon Poppy Cookies, Oatmeal Raisin Cookies, Apple Pecan Granola Bars, Ginger Peach Muffins and Double Chocolate Brownies(gluten/soy free) are at the co-op. Gluten free/soy free Double Chocolate Brownies are at the co-op. Toasted Coconut Cream Filled Cakes, Chocolate Mint Sandwiches, Chocolate Cherry Cookies, Chocolate Chip Cookies, Cranberry Ginger Muffins and Cherry Lemon Muffins are at the co-op. Peanut Butter Cookies, Cherry Coconut Cookies(gluten/soy free), Oatmeal Cream Pies, Cinnamon Raisin Muffins, Ginger Peach Muffins, Granola Bars and more at the co-op. Blueberry Cakes with Lemon Cream Cheese Icing, Cranberry Ginger Muffins, Cinnamon Raisin Muffins, Lemon Poppy Cookies, Chocolate Cherry Cookies, Almond Chocolate Chip Cookies(gluten/soy free), Peanut Chocolate Chip Granola Bars and Oatmeal Cream Pies are at the co-op. Chocolate Chip Cookies, Peanut Butter Cookies, Chocolate Mint Sandwich Cookies, Cherry Coconut Muffins, Lemon Poppy Ginger Muffins and more at the co-op. Double Chocolate Brownies(gluten/soy free) are at the co-op. Chocolate gluten free cookies are coming soon. I have been working with these chocolate cookies(gluten/soy free) for a few weeks now. I'm happy with the results so you can look for them next week at the co-op. Chocolate Mint Sandwich Cookies, Oatmeal Raisin Cookies, Macadamia Chocolate Chip Cookies, Ginger Peach Muffins and Light Lemon Cream Filled Cakes are at the co-op. 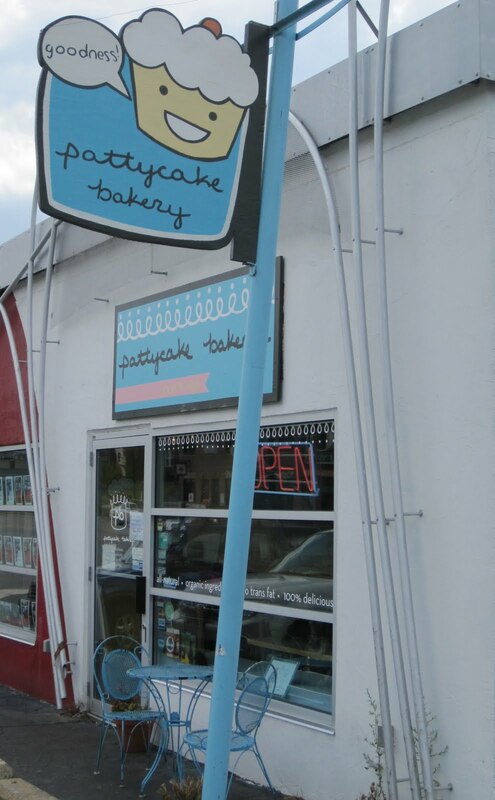 It's been about a month since I went to Pattycake Vegan Bakery. The trip to Columbus, Ohio in itself was great but the stop at Pattycake made it better. I had already heard about Pattycake and checked out their website. 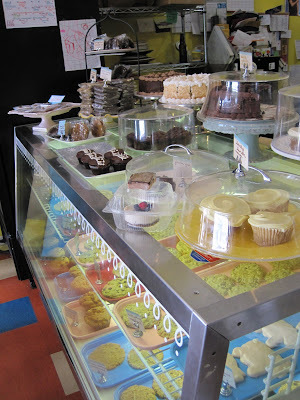 It's pretty amazing to walk inside and see a place filled with tasty looking treats and knowing that it's all vegan. I really had a hard time choosing only a few things to try so I picked out a bunch. I went with a lemon cupcake, pumpkin spice whoopie pie, ho-ho cupcake, cheescake and chocolate caramel mousse cake. I did not eat all of these at once, it was spread out over a few days. I do have a sweet tooth but couldn't possibly handle it all. I wasn't disappointed with anything and the staff was quite friendly. If you are in or near Columbus check them out. Apricot Almond Cookies(gluten/soy free), Chocolate Cherry Cookies, Cherry Coconut Muffins and more at the co-op.